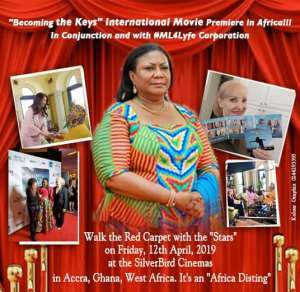 After the Star-Studded VIP premiere of Robin Jay’s “Becoming the Keys” Movie in Las Vegas, the Motivational Film is NOW IN Ghana this April! www.thekeymovies.com. ML, who is also a Freelance Writer, and a Brand Marketing Strategist, stars as a Panel Expert / Coach in the PureFlix Inspirational and Motivational Self-Help Movie, "Becoming the Keys". She starred as the First Black African Female to portray the role of a Seasoned Life Coach and Panel Expert in "Becoming the Keys" with the likes of Veterans, Jack Canfield, Joseph Vitale, Brian Tracy, and other Renowned Motivational Speakers. "I am humbled by the great opportunity that the aforementioned Self-Help Movie has placed within my lap. As a female, As a Mother, As a Ghanaian-American, and As an African, I avidly welcome the Limitless avenues that will be availed to me inadvertently; AS WELL AS the people of my native country, by virtue of even sheer investment, tourism and overall global exposure. The world is now a borderless global village and it simply amazes me that the Good Lord has been able to use "Little ML" to bridge gaps and cross borders of inter-culturalism et al. I am EQUAL to the Task and the Sky(e) is ONLY the beginning for my future Media exploits and interrelationships. To God be the Glory!" "Becoming the Keys" is the third film in the Key Movie series. The films are unique hybrids that combine a narrative story and fictional characters interacting with cameos from some of today’s top thought leaders. Tickets for “Becoming the Keys" are going for 40 GHC / 60 GHC for Couples for the General Admission; or 100 GHC / 150 GHC for Couples for the Intermediate Admission or 250 GHC / 400 GHC for Couples for the VIP Admission. VIP admissions come with a free copy of the Movie DVD. Contact Patricia "PG 1" Ghansah at: +233 546 646 145 and send your ticket payments via Mobile Money in Accra before the event in a few days. Come one ... Come all!! !